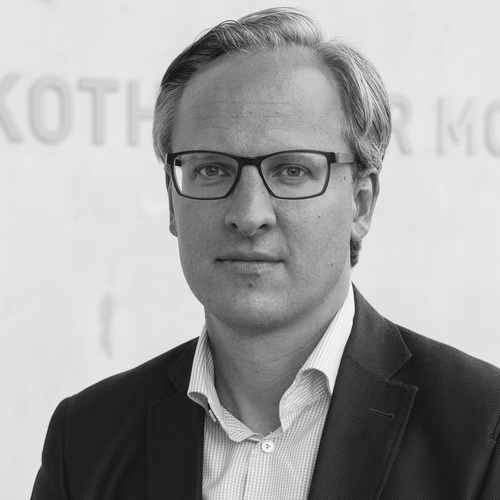 Oliver Kase is Chief Curator of Modern Art at the Pinakothek der Moderne and oversees the Max Beckmann Archive. Since 2012 he has curated numerous exhibitions on modern art, including: Licht-Bilder. Fritz Winter und die abstrakte Fotografie (Light Pictures: Fritz Winter and Abstract Photography), 2012/13, on the work of the student of the Bauhaus; Farbenmensch Kirchner (Kirchner: Man of Colours), 2014, on the painterly technique of the Expressionist Ernst Ludwig Kirchner; and GegenKunst (Counter/Art), 2015, on the juxtaposition of “degenerate art” and Nazi art. From 2011 to 2012 Oliver Kase was assistant-curator for The Art of Enlightenment, a major international exhibit coproduced by the Staatliche Museen zu Berlin, the Staatliche Kunstsammlungen Dresden, and the Bayerische Staatsgemäldesammlungen Munich, that went on show at the National Museum of China, Beijing. Oliver Kase earned his PhD in 2007 from the University of Heidelberg before serving as curatorial assistant at the Bayerische Staatsgemäldesammlungen and Bayerisches Nationalmuseum. He went on to become curator of the Fritz Winter Foundation and the Theo Wormland Foundation, which hold important works of Surrealist and magic-realist art. Oliver Kase is the author of numerous publications on the art of the 18th to 21st century and is a lecturer at the Ludwig-Maximilians-Universität, Munich.